Your company brochure tells the story of your business. MARION’s brochure design team works with Austin-based companies to create visually stunning, informative printed materials that speak to a range of audiences. Many businesses review and catalog brochures as part of their assessment of a potential vendor. Far from being an afterthought in the age of digital marketing, a brochure is an integral part of an overall marketing strategy. How Important is Good Brochure Design? Brochures are what you present in board rooms, at stakeholder meetings, and to potential investors. It’s the tangible piece of marketing you distribute at trade shows and in direct mailers to potential customers. The design of your brochure must match your brand identity and excite all audiences about your product. As an established Austin marketing firm, MARION is savvy to current trends in business documentation and brochure design. 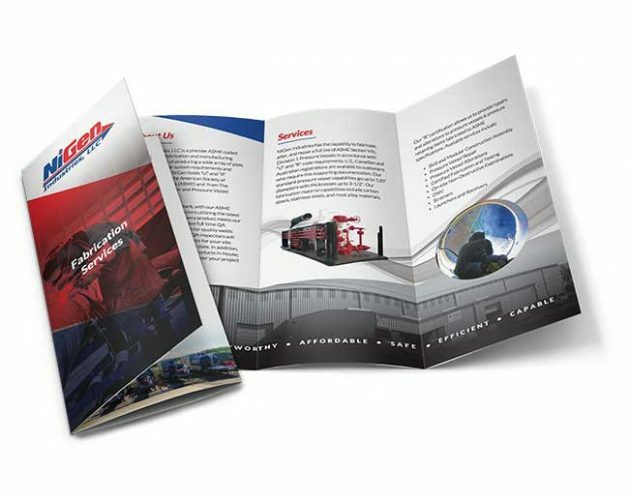 Many of our customers return to us year after year to produce brochures for annual events, and our team creates a unique look and feel each time. MARION works with you to create materials that reflect and promote your brand identity. As a business owner, you are the expert on the details of your business. You know what financial information you want to make prominent, what product specs most appeal to consumers, and how you want to describe the culture of your brand. As designers and marketers, the team at MARION packages that information in a way that creates the maximum impact for your audience. We work with font, text, color and images to make an impression that elevates your message. Every detail–down to the weight and finish of the pages–is analyzed by our team members. If you’re ready to learn more, contact MARION to discuss your brand objectives. You can sample some of our previous brochure design work on our website.